In your dream, you’re heeled over under full sail, 20-knots of wind crossing the port beam. A sister ship, another Hallberg-Rassy, shadows you 200 meters to the lee. Your bow slices through the waves, spray occasionally crossing the deck. The wind picks up to 25 knots. The boat responds. You contemplate shortening sail, but your knot meter shows seven and a half, then eight knots of boat speed – hull speed. The boat begins to hum. It dawns on you that you have reached sailing nirvana. You pinch yourself. But you don’t wake up. You’re already awake. And so it has been these past few days. Last Friday, we made contact with Barrie and Kath Stott of the HR43, Yarona. We had said farewell to them at Gold River at the end of June before returning to Colorado. While we were away, they finished launching Yarona and made their way to Halifax where we found them on the docks downtown. 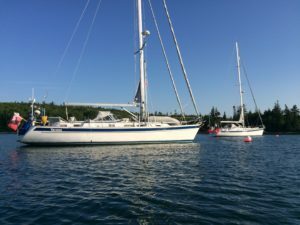 Since Friday, we have sailed about 50 nautical miles per day together along Nova Scotia’s East Shore, sharing truly fine anchorages, exquisite meals, and cheerful camaraderie. Our goal: to get through the St. Peters Canal and into Bras D’Or Lake. This afternoon, we transited the canal lock, the oldest in North America, and rose two feet from sea level to enter the lake. 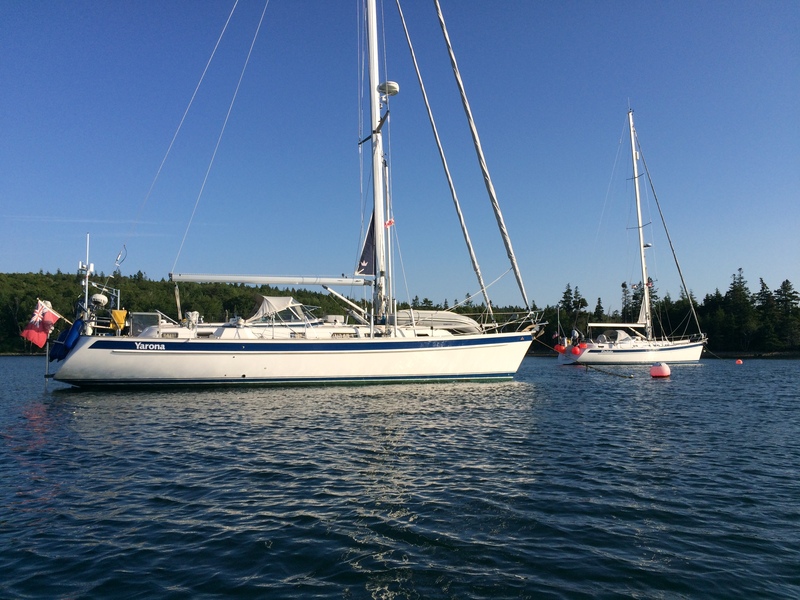 Yesterday, as we approached our final anchorage at D’escousse, Isle Madame, the scene described above became reality. Rallying with another Rassy, and in particular enjoying Kath and Barrie’s company, has made these past few days a dream come true. We’ve made it into Bras D’Or Lake, but we’re not done yet as we’ve got the rest of this week to explore the lake before rendezvousing with Yarona again, this time in Baddeck, the capital of the Bras D’Or region.